Noggle Vineyards, located in the Long Valley region of Lake County. Photo courtesy of Noggle Vineyards. 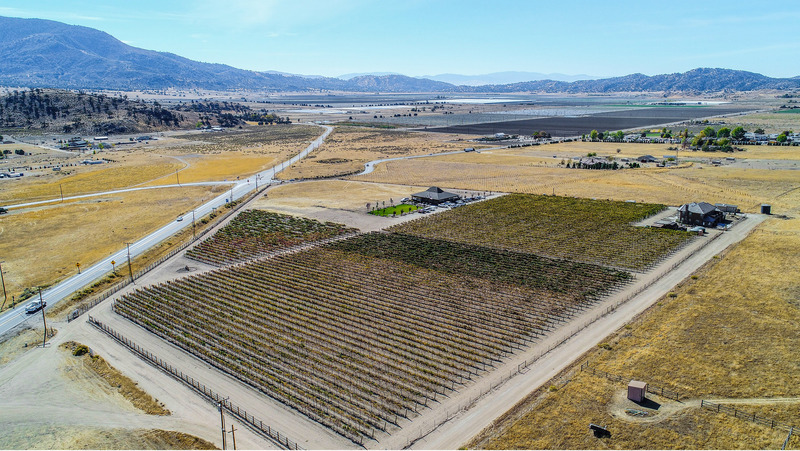 California’s vast wine-growing areas have already gone through several rounds of divisions and subdivisions into American Viticultural Areas (AVAs). Given the state’s enormous size and diversity, these divisions are quite useful in helping sommeliers and other professionals understand how wines vary between different regions. In the past few years, eight additional AVAs have been proposed (along with three boundary changes to existing AVAs). Should they be approved by the U.S. Alcohol and Tobacco Tax and Trade Bureau, there will be new ways to highlight the unique terroirs within existing regions, as well as two completely new areas to talk about. SevenFifty Daily spoke with several wine professionals in California to get their take on this collection of places—some familiar and a couple not—in the state’s winemaking landscape. Syrah is king in Alisos Canyon. “I find the Syrahs, especially, are showing more savory characteristics on both the nose and the palate—black fruits with meat, smoke, and black pepper,” says Sarah Farley, a certified sommelier and the tasting room manager at Presqu’ile Winery in Santa Maria. “Though beautiful as a current release, I have had some vintages that were a few years older, and they are just singing with complexity. 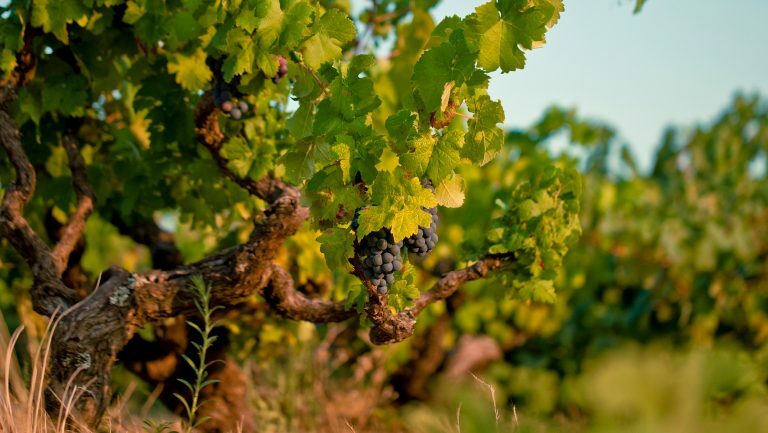 They show beautiful structure while retaining an elegance only found in cooler growing regions like this canyon that’s swept by cool ocean winds.” The region produces several other Rhône wine grapes as well, including Grenache, Viognier, Marsanne, and Roussanne. The Palos Verdes Peninsula, which covers about 30,000 acres, sits entirely in Los Angeles County. 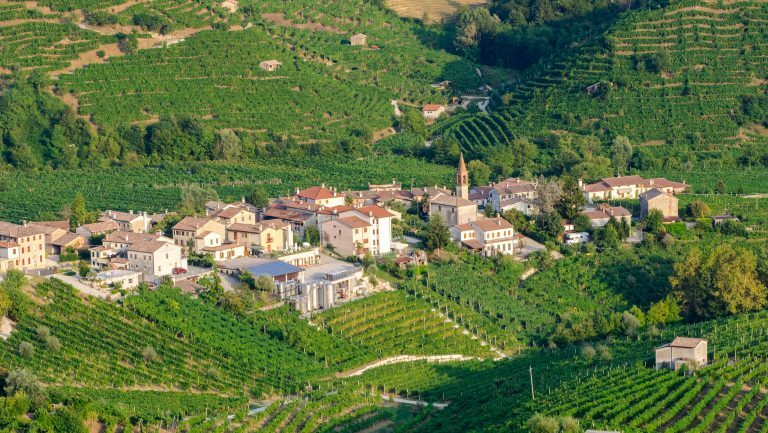 The landmass contains mostly large estates, and many residents have been growing wine grapes for decades. Two of them have made the jump to operating commercial vineyards, and they’re excited about the prospect of labeling their wines with their region rather than the larger South Coast AVA. “People refer to the Palos Verdes Peninsula as The Hill,” says Jim York, the vintner at Catalina View Wines in Rancho Palos Verdes. “We have relatively steep slopes. There’s no flat land available. Because of that, everything has to be done by hand.” Underlying the soil is Altamira shale, an unusual geological formation that adds minerality to this area’s wine. Along the coast, growers produce mostly thin-skinned, cool-weather grapes like Pinot Noir and Chardonnay. Further inland, growers on the Palos Verdes Peninsula can grow warmer-weather varieties such as Merlot and Cabernet Sauvignon. 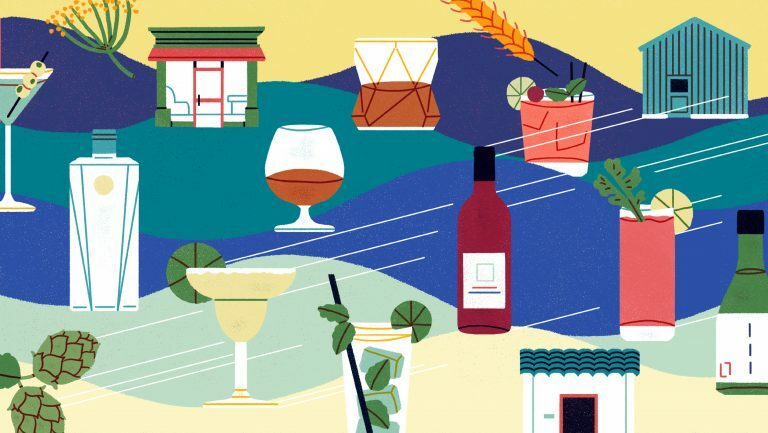 “The area is pretty unique in that you have a cool Mediterranean climate, but you don’t get as much fog as you would in Santa Barbara,” says Alicia Ajolo, the wine director for Terranea Resort in Rancho Palos Verdes. 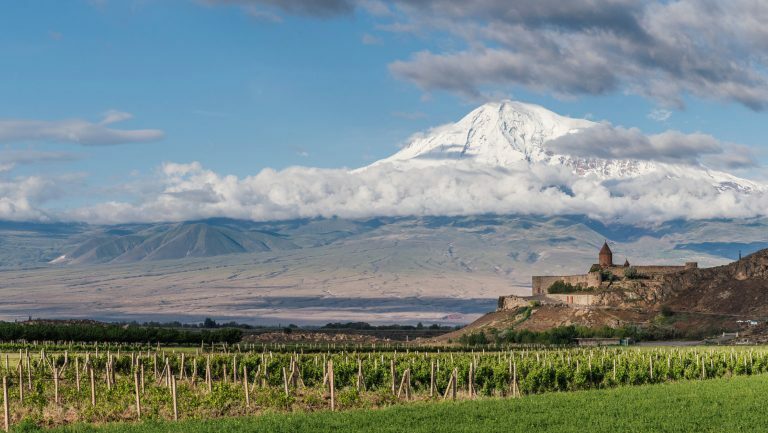 “Since you don’t have that fog layer to drop the temperatures at night to create that diurnal shift, I feel you get a little more steeped tea and savory notes in the wines.” There’s also a layer of spice to many of the wines from the region. 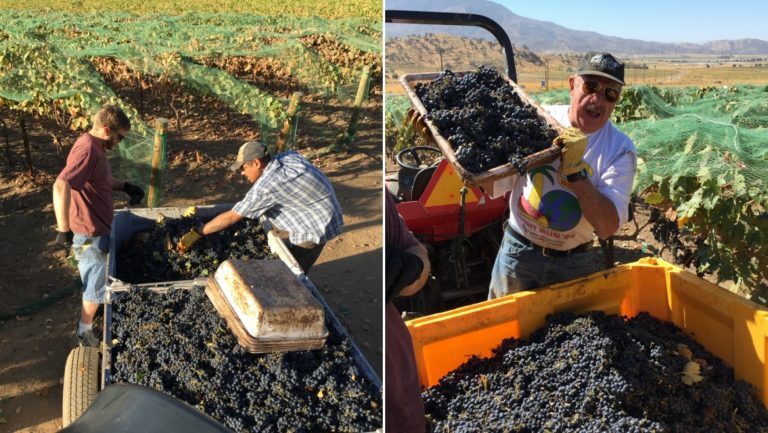 Tehachapi 2018 harvest. Photo courtesy of Jim Arnold. The proposed 34,155-acre Paulsell Valley AVA is located in Stanislaus County. 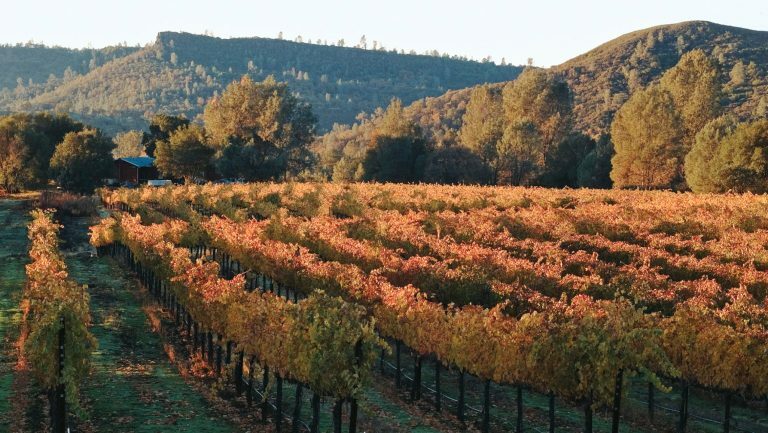 According to Don Jarvis, the business manager of Rock Ridge Vineyard and Rock Creek Vineyard in Green Valley, it’s bordered roughly by the Modesto Reservoir to the south, the cities of Oakdale and Knights Ferry to the west and north, and Tuolumne County to the east. Distinguishing this wine-growing area from others around it are interesting topographical formations that create a “mound-intermound relief” landscape. “You’ve got these mounds that stick up above the normal terrain,” says Patrick Shabram, the consulting geographer who wrote the AVA application at the request of local vineyard owners. “They’re made from these remnant layers of tuff—an ash-derived rock—that create soils that are pretty [distinct] from surrounding areas.” The topography rises above the floor of the San Joaquin Valley, putting the grapes at elevations between 350 and 400 feet. Conditions in the area tend to be slightly warmer and wetter than those in the San Joaquin Valley as well. The area has proven exemplary for growing Cabernet Sauvignon, Petite Sirah, Petite Verdot, and Teroldego, an Italian grape. “This is an emerging viticultural area,” says Shabram. “There are lots of almonds [grown here] right now. There have been some vines in the area for a while, but there are getting to be more.” Wines from Rock Creek Vineyard’s French Bar Wines label tend to be dark in color with rich black fruit notes such as boysenberry, plum, and black cherry. The wines from Arroyo Grande Valley and Edna Valley—the two other AVAs in San Luis Obispo (SLO) County—are relatively well known, but many of the vineyards stretching between Pismo Beach and Cambria are fairly new. That led a group of county residents—notably Aaron Jackson, the owner and winemaker of Aaron Wines in Paso Robles, and Brian Talley, the owner and winegrower at Talley Vineyards in Arroyo Grande—to seek recognition for grapes grown between a quarter of a mile and 15 miles from the Pacific Ocean. The Pacific has tremendous influence over the grapes. “We see a lot of heavy coastal fog pretty much year-round because we’re so close to the coast,” says Heather Muran, the executive director of San Luis Obispo Wine Country in Pismo Beach. The marine layer of air keeps the climate cool. The other big influence on the wines of the SLO Coast is the soils, which are very mixed across the proposed AVA’s 408,000 acres. Vineyard owners see everything from sandy loam and clay to rich volcanic deposits. Tehachapi vineyards. Photo courtesy of Jim Arnold. Arnold explains that the proposed AVA is in a mountain pass with the Antelope Valley—characterized by a desert climate—to the east, and the San Joaquin—with a temperate climate—to the west. “We get warm breezes that cut down on the frost, which allows us to have a long-enough season to grow grapes,” he says, adding that “at 4,000 feet, we have stronger ultraviolet rays, which thickens the skins on the grapes.” As a result, the Zinfandel, Primitivo, Syrah, and Cabernet Sauvignon that come from the region have deep colors and high levels of tannins. 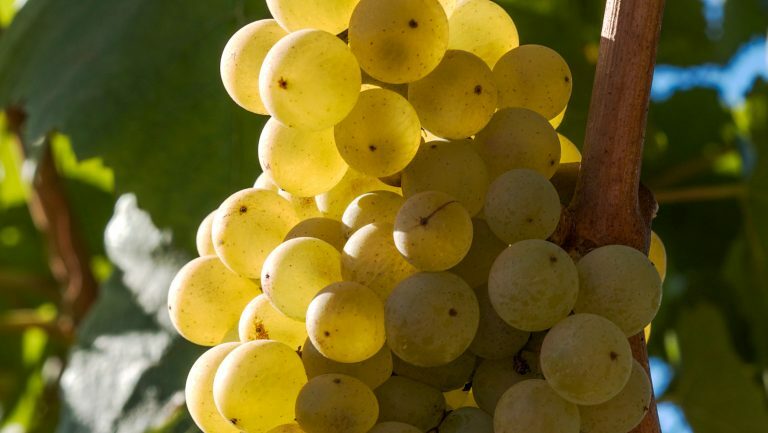 The main white wine grapes grown in the seven vineyards currently operating in the area are Viognier, Riesling, and Chardonnay. The wines from the Tehachapi Mountains have been very well received so far. Arnold has earned prizes at wine competitions over the past three years. 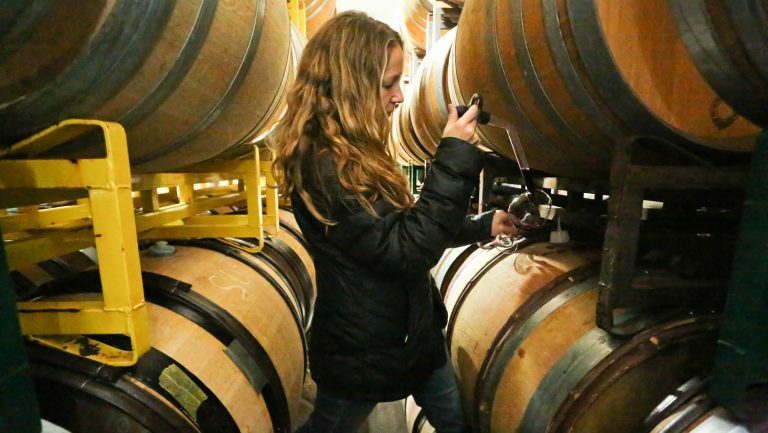 Honors include a double gold from the San Francisco Wine Chronicle Competition for Triassic’s 2012 Zinfandel Estate Grown, and a gold from the Los Angeles International Wine Competition for the winery’s 2015 Syrah. The area north of Clear Lake in Northern California is sometimes referred to as the citrus belt because it has a warmer climate than the rest of Lake County. Budbreak happens about two weeks earlier, which means more hang time for the Sauvignon Blanc that’s widely grown in the 17,360-acre region. Warm days in the region give way to cool nights, and that diurnal shift benefits the grapes. “It leads to slower fruit ripening, allowing the development of more complex flavors,” says longtime Lake County consulting winemaker Mark Burch. “Yet the clusters maintain the high acidity levels paramount to premium Sauvignon Blanc production.” The area also gets more rainfall than other parts of the county, and the soils tend to be clay loam or silty loam, both of which hold high levels of nutrients. Terry Dereniuk, the owner of Terry Dereniuk Consulting in Kelseyville, who wrote the AVA application, points out that “Sauvignon Blanc produced with grapes from the Upper Lake Valley is crisp, with grapefruit and melon overtones and just a hint of grassiness that’s not over the top.” The Upper Lake Valley also has a small planting of Muscat Canelli, a Greek grape, for making white wine. 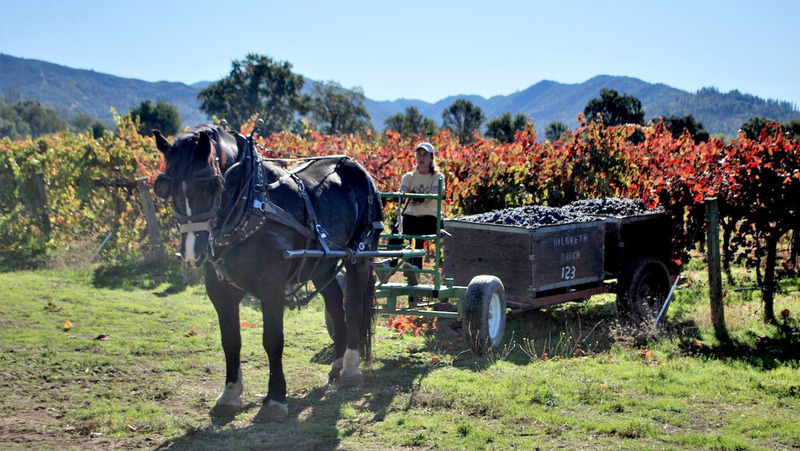 Dr. Glenn Benjamin and Dana DiRicco Benjamin use Percheron draft horses in their certified organic vineyard on Elk Mountain Road in the Upper Lake Valley. Photo courtesy of Elk Mountain Vineyard. The proposed 141,846-acre West Sonoma Coast AVA falls entirely within the existing Sonoma Coast AVA. “The common characteristic that’s shared by all of the areas in the West Sonoma Coast [region],” says Shabram, “is that they’re on the edge of acceptability for being able to grow Pinot Noir in Sonoma County.” As with the SLO Coast area, regular fog banks keep the vineyards here cool. However, many vineyards are planted at higher elevations, so while the fog keeps the temperature relatively moderate, the grapes are still exposed to plenty of sun. That helps increase sugar accumulation in the fruit. Pinot Noir grown in warmer regions tends to have more fruit-forward characteristics, says Carroll Kemp, the winemaker and a partner at Alma Fria in Annapolis. In the cooler climate of the West Sonoma Coast, earth and fruit come into nearly equal balance with each other. The earth flavors are influenced by the native fauna and often yield notes of pine and what locals call redwood spice—a flavor similar to the scent of fresh tangerine peel rubbed on a person’s skin. Sophia McDonald is a freelance writer who lives in Eugene, Oregon. Her work has appeared in numerous publications and on websites, including Wine Enthusiast, Eating Well, Sip Northwest, and 1859 Oregon’s Magazine.